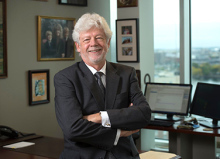 Thomas Van Dyke, D.M.D., Ph.D., is Vice President for Clinical and Translational Research, and Chair, Department of Periodontology at the Forsyth Institute in Cambridge, MA. His research interest is understanding the structural and functional relationship of the inflammatory process by defining the complex interactions between phagocytic cells and their environment, particularly microorganisms, in periodontal and other infectious diseases. Dr. Van Dyke is also involved in clinical research and clinical trials focusing on drug treatment for periodontal disease, local delivery systems, and clinical trials of anti-plaque/anti-gingivitis agents, local anesthetics, regenerative periodontal therapies and early onset periodontitis. The remainder of his time is devoted to training of fellows and administration. He received his D.D.S. (1973) from Case Western Reserve University; M.S. (1979) from SUNY at Buffalo in Oral Sciences; Periodontics Certificate (1980) from SUNY at Buffalo, and his Ph.D. (1982) from SUNY at Buffalo in Oral Biology. Dr. Van Dyke received the Balint Orban Memorial Prize for Research in Periodontology (1981). He is a Diplomate of the American Board of Periodontology (1989), and he received the IADR Award for Basic Research in Periodontology in 2001, the Norton Ross Award for Excellence in Clinical Research in 2002, and the William J. Gies Periodontology Award in 2008. He serves on the editorial boards of Infection and Immunity, Journal of Periodontology, Journal of Periodontal Research, among others, and he has edited two volumes of Periodontology 2000. He served as President of the International Association of Periodontology (1997-1999). Dr. Van Dyke has published 250+ original articles, and numerous abstracts and book chapters. He is a member of the American/International Association of Dental Research; American Academy of Periodontology; International Association of Periodontology, American Association for the Advancement of Science, American Society of Microbiology, IADR Periodontal Research Group, American Dental Association, and Northeast Periodontal Society. His research interests are the structural and functional relationship of abnormalities of the inflammatory process with focus on phagocytic cells and microorganisms, in the etiology and pathogenesis of periodontal diseases; host susceptibility to specific periodontal infections. He is best known for his work on the pathogenesis of juvenile periodontal diseases, resolution of inflammation in neutrophil biology, and clinical research.